I spent today at the The International Crane Foundation in Wisconsin, the only place anywhere one can see all 15 species of the world's cranes. The organization is involved in conservation projects from Wisconsin to China, Russia, Bhutan, Japan, Africa and more to save these majestic birds. Of the 15 varieties, 11 are endangered, some critically endangered. 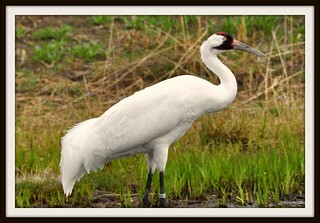 The whooping crane is the rarest, with about 600 worldwide... but that's up considerably from the low of 16 that once existed. Symbols of grace, beauty, fidelity and hope, cranes inspire us in many ways. The timing was great today, as I got to see the courting dances of several birds, and some on nests. More to come when I get home.